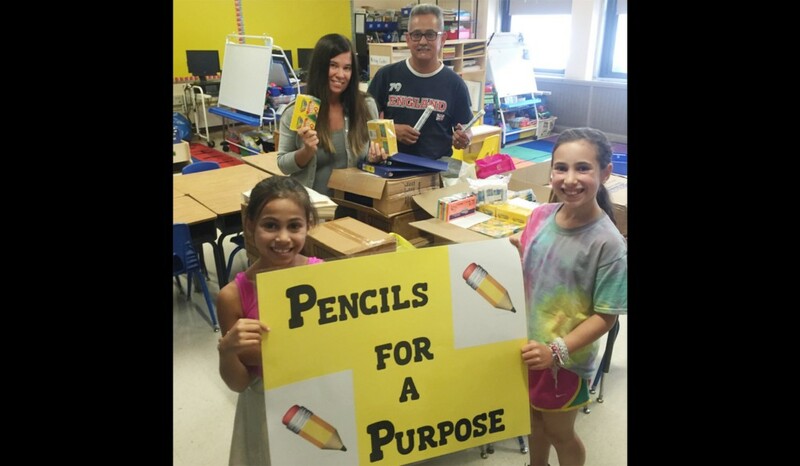 The “Pencils For a Purpose” initiative is raising funds through Central School’s annual school supply ordering to give school supplies to classrooms in Camden. For Karen Sobel’s two daughters, Noa, 11, and Grey, 9, the best part of the first day of school has been arriving to a pile of school supplies. When the two Central Elementary School students mentioned to their mother they wished every student could have this same experience, Sobel, who was the parent on the Parent Teacher Association in charge of school supply ordering at the time, wondered if there was a way to share that experience with students in need. In September, second-grade students from the Thomas H. Dudley Family School will have this same experience as Sobel is helping Central School raise funds through her Pencils For a Purpose initiative, which aims to provide school supplies to classrooms with students in need. “It’s an outlet for people who want to help and don’t know how,” Sobel said. Sobel said each year Central school offers parents the option to order the entirety of their students’ supplies through the school. As the PTA parent in charge of the supply ordering in 2014, Sobel learned the supplier, Staples, gave the school an incentive of the profits back. She said she asked Principal Shannon Simkus what these funds were used for and learned they usually just went into the PTA’s general fund. She was informed the funding wasn’t something the association relied on each year. The following school year, Sobel asked permission to remove this money from the PTA’s funding. She said she wasn’t sure what she wanted to do with the extra money, but she knew she wanted Central School to use the funds to give back. In discussing the funds were coming from school supplies with her daughters, the two girls mentioned there are students in the area who don’t have all the school supplies they need, so why didn’t they use the money to provide supplies for those students? She said the trio decided if they were going to make this their project, their initiative needed a name. Sobel said her daughters came up with the name Pencils for a Purpose, and she worked with Staples at the end of last school year for parents to donate to the initiative via a link while they were ordering supplies. Last June, she met with Collette Gil, a second-grade teacher at the Charles Sumner School in Camden she had connected with through a mutual friend, and together, the pair made a wish list of supplies for second graders with no expectations as to how many Pencils for a Purpose could provide. Gil said Pencils for a Purpose delivered enough supplies for three second-grade classrooms with some additional supplies also going to two other grade levels. She said for some of these students who don’t have school supplies readily available to them, the experience was exciting. Sumner school is due to close at the end of this school year, and Gil has transferred to Thomas H. Dudley Family School where she said students are equally in need of school supplies. As such, Pencils for a Purpose will supply as many classrooms as it can at the Dudley school for 2017–2018. While last year, Pencils for a Purpose tested the waters to see what it could provide, this year Sobel and Gil have designed a kit that features all the supplies a student at the Dudley school would need for the year. The incentive money will fund as many kits as possible, but through the school supply ordering site, anyone can purchase kits for donation. Gil said it makes a world of difference for both teachers and students when they have adequate supplies. “It enriches our classroom when we have the materials to make our skills and all our reading and math curriculum come together,” Gil said. With notebooks, students can do writing assignments, and with binders, students can take home photocopies of poems, Gil said. Some of Gil’s students have been known to request school supplies on their Christmas and birthday present lists, and both students and teachers at the school are grateful to receive the supplies this September. Sobel said her goal is for Pencils for a Purpose to get to the word out in the Haddonfield community about the initiative, so the partnership between schools continues for years to come. “My goal is ultimately is to get this so tightly established, so I can hand it off when my kids leave the elementary school,” Sobel said. Kits are available for purchase for $15.15 through the website http://www.shopttkits.com. Those interested in donating a kit can purchase one through the website using account #15849 and clicking the box “Central PFP Donation” at checkout. Those not ordering school supplies but still wishing to donate can still order through the website or contact Karen Sobel at kbsobel@verizon.net to purchase a kit or make a donation.